I worked here when I was in high school and have been eating here since well before that. Trattoria Rustica is one of those rare places that provides you with both quality and quantity. Meals are enormous, and come served with a slab of home-baked foccacia bread. Most entrees are also served with a salad. You will leave stuffed, and most likely with leftovers. The funny thing is, the owner is not even Italian, but Greek. It’s a family-operated affair. In talking to him a few years ago, he told me that one time he went to a fancy restaurant, paid exorbitant prices, and still left hungry. He was so annoyed by the experience that he said, “If I ever open up a restaurant, no one will ever leave hungry.” He’s been accomplishing that mission ever since. 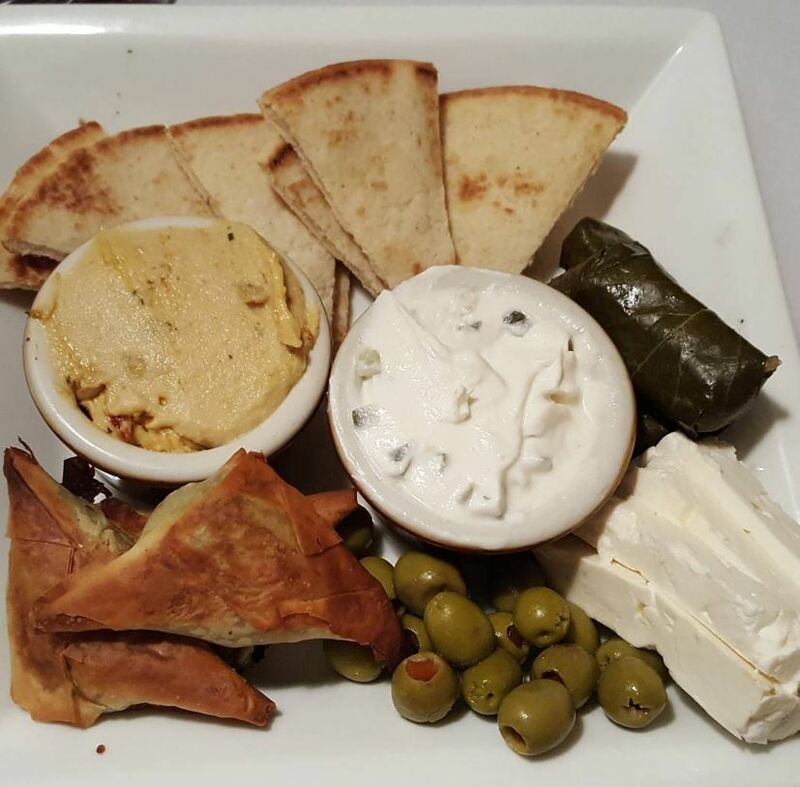 For an appetizer, I always end up wanting the Mediterranean platter which is an assortment of classic Greek items. Though presumably not made in-house, for $8.95 it is a total bargain if you have a table of three or four. You won’t need many appetizers because of the salad and warm, fresh bread, but this sampler is a nice and salty way to start. You’ll be given a plate with stuffed grape leaves, pita bread, spanakopita wedges, slices of feta cheese, olives, and bowls of hummus and tzatziki sauce. The entrees I order usually alternate between my favorite, Dolcezza, and something called Chicken Ravello. The latter is what I ordered on my most recent visit. 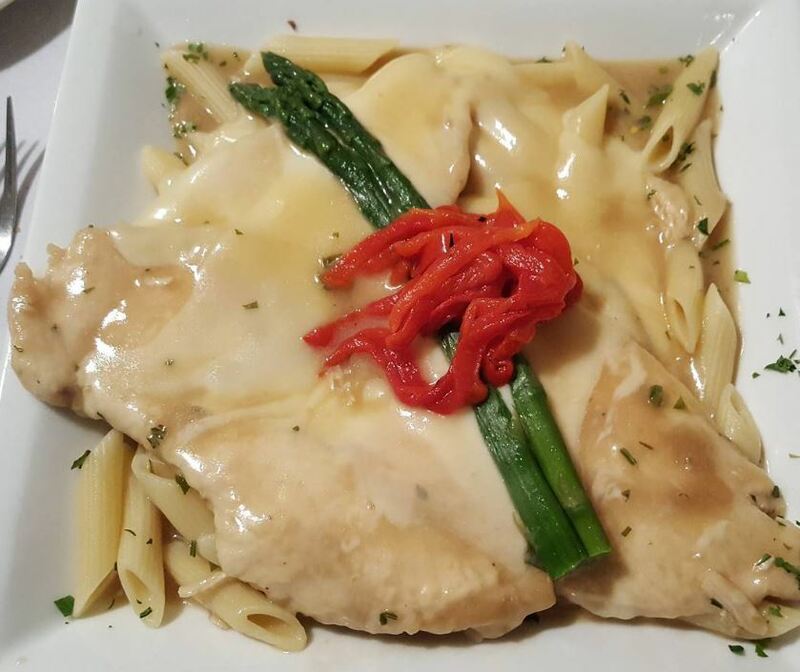 Three chicken cutlets are sauteed in a Marsala wine sauce, covered with mozzarella cheese, red peppers, and asparagus, and served over the pasta of your choice. It is massive. You probably will not finish it, as even I only get through two of the chicken breasts. The other meal is a pasta dish: penne tossed in a creamy vodka sauce with strips of grilled chicken, asparagus spears, and roasted red peppers. The result is creamy and hearty, while the grill marks on the chicken open up additional layers of flavor which work well with the richness of the sauce. I usually end up finishing this one. My only complaint regards the focaccia sandwiches. The prices are fine, but the contents are most definitely lacking. The massive portions featured in the entrees are severely cut down to the point where you are eating almost nothing but bread. For example, my dad usually orders a grilled chicken over sautéed broccoli rabe entree. For those who have never cooked broccoli rabe, I will tell you that it shrinks dramatically during the cooking process. You have to start out with a ton to get even a fair amount of edible food on the plate. This meal comes with a hefty helping of the vegetable, yet if you were to order the same meal as a sandwich, there is hardly any at all. The chicken cutlets are thin, which is nice, but when used on the bread, it appears to be nothing. Had your first dining experience here included those sandwiches, then you would probably have been disappointed. I’m still giving Trattoria Rustica a 4 out of 5 stars because of how simple and not pretentious the food is, yet it still encompasses so much flavor. The portions are reminiscent of an old Italian grandmother’s cooking, where she just wants to load up your plate even though she knows you’ll be stuffed halfway through. Heck, by the time you are done with the bread, salad, and appetizers, you’re nearly there. Prices are also pretty good. There aren’t many places where you can get a dinner of this quality with all the extras for under $18. I hope they never change a thing. Trattoria Rustica is located at 259 Main Street in Matawan, New Jersey.